FACT CHECK: Sandy Hook Victim Spotted Among Peshawar School Dead? Claim: Sandy Hook shooting victim Noah Pozner was pictured among those killed during a December 2014 attack on a school in Pakistan. I have not subscribed to any of the idiocy of the Sandy Hook conspiracy theorists, but this one is genuinely bizarre. Noah Pozner. There is a photo, in a series of related photos showing him in the same clothing, posted on his “Official Facebook Page.” It is definitely the same child shown over and over again in other photos on the page. The same exact photo appears in multiple sources related to the Peshawar, Pakistan school massacre, allegedly depicting a victim of the massacre. It is unmistakably, undeniably the same exact photo. Origins: On 16 December 2014, 145 people were killed in an ambush attack on Army Public School in Peshawar, Pakistan. Among the victims were 132 children ranging in age from eight to eighteen, and the tragedy was reported upon widely across the world. a woman standing vigil for the victims of the 2014 attack appeared to be holding an image of a small, smiling boy. The image was instantly recognizable to many as the well known face of Noah Pozner, 6, a victim of the December 2012 Sandy Hook Elementary School shooting in Newtown, Connecticut. Twenty children and six teachers were killed at Sandy Hook Elementary in December 2012 during the course of an event that (like the tragedy in Peshawar) deeply upset people across the world. In the aftermath of the 2012 massacre, several conspiracy theories emerged either claiming the murders did not occur in the way they were reported, or the event was wholly fabricated as a “false flag” attack. Initially the conspiracies orbited a larger concern that strict gun control laws would be introduced, spurred by the widespread grief that ensued from Sandy Hook. Even when the predictions of a gun grab did not come to pass, the conspiracy theories inspired by the fear of it failed to abate. When the above-displayed image began to circulate, many of what have come to be known as “Sandy Hook truthers” believed it was further evidence a nefarious conspiracy of unexplained origins was at work. 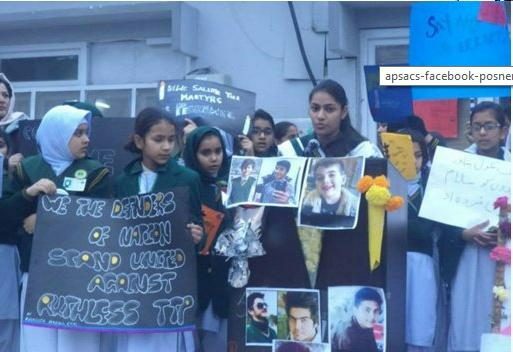 Why else would a woman in Pakistan be displaying a picture of Noah Pozner at a vigil for slain Pakistani students who were killed two years after he was? Lenny is also one of the 10 plaintiffs in a negligence and wrongful death lawsuit against the manufacturer, distributor and seller of the Bushmaster AR-15 rifle that Lanza allegedly used in the Sandy Hook school shooting. Can the photo’s misuse simply be brushed off as another bumbling Google image search mistake? Is it be willful subterfuge aimed at poking fun at those who question the validity of the Sandy Hook event? A number of explanations might apply to this puzzling photograph. The first is that an image of Pozner was mistakenly included in the vigil by someone who turned up his picture while performing an online search using a term such as “December school massacre” to find photos of those killed in Peshawar and and did not recognize his face (because he had dark hair and facial features not unlike those of many of the victims in Peshawar). Another is that his image was deliberately included by mourners as an homage in order to publicly link multiple incidents of young, innocent victims’ losing their lives in senseless school shootings. A third is that a massive worldwide cabal colluded to perpetrate or falsify the murders of more than 150 students and teachers collectively spanning the globe from Connecticut to Pakistan, and the puppeteers of this conspiracy were so inept that they failed the basic task of obtaining novel images to assign to each of the victims of the violent acts.